Mallorca – what a magical island! 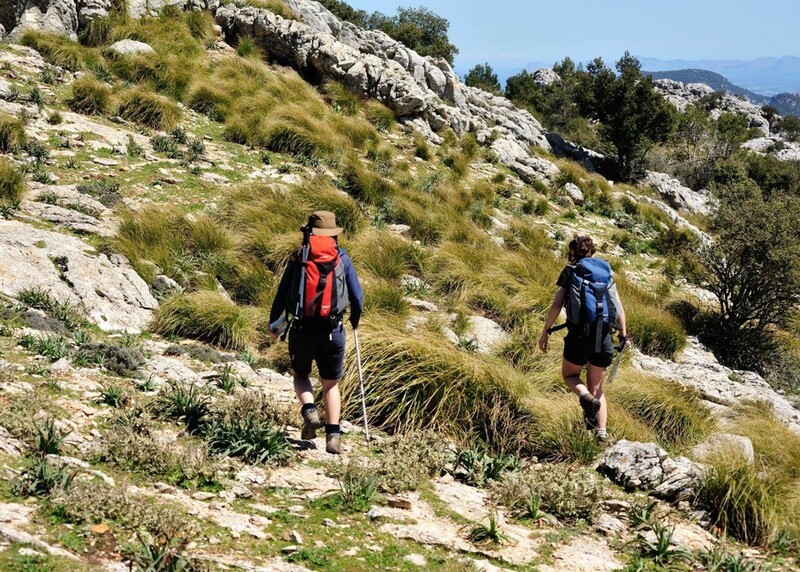 The western half of Mallorca, (Balearic Islands, Spain) offers wonderul walking and breathtaking views. It’s worth getting up high to appreciate the views. 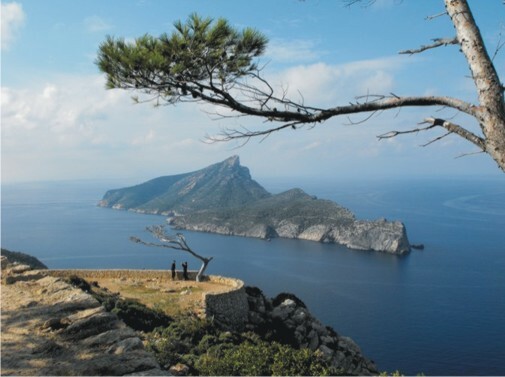 Here’s the island of Sa Dragonera, viewed from La Trapa, Mallorca. Spain’s Costa Blanca is so much more than the coastal strip – look inland – you could be up on those white mountains! Walk! 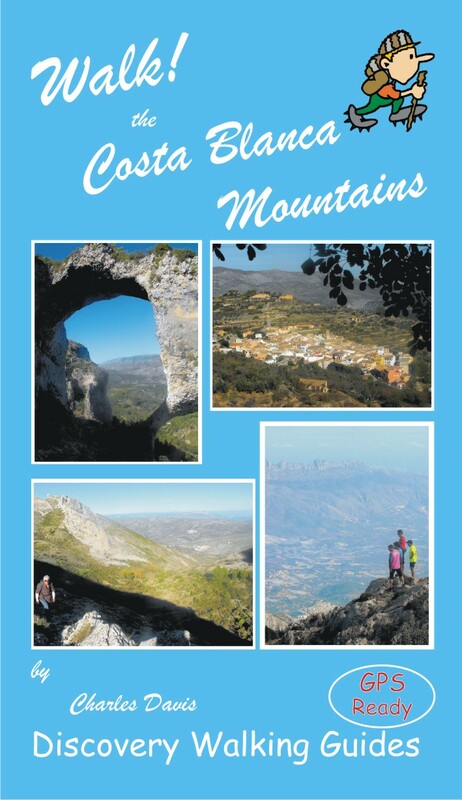 The Costa Blanca Mountains is available as a printed book – from today you can also download the pdf version. Perfect if there’s no time to get the printed copy before you head off adventuring. It’s also handy if you want to print off one or two pages to carry for the day, saving weight in your pack. Another update from Neil C, for the start (and end) of Walk 33 Tabayesco circular in Walk! This is the track you follow at the start of the walk. “We parked for Tabayesco circular (33) at the recycle bins (noting they were perhaps 70 or 80 metres from the bus stop). There was a very clear unmapped track leading away from the bins in the direction shown on the map – I wasn’t entirely happy that it was the correct track which seemed to be mapped nearer the road junction, but we set off anyway (a car came down the track [shows how major it was] from nearby houses and the driver waved a friendly greeting to us). After about 200 metres of walking and surprised not to have found the jeep track on the left, we were shouted at from a house garden above by an English voice: “You are going the wrong way!”. “Sorry?” I said, not quite clear how someone could know where we were going. We returned to the bins and beyond them to the bus stop and found the real track correctly mapped. If you’re doing Walk 33, note that the walk also ends at the bus shelter (where it starts). Disregard references to the bins at the start and the end of the route description. 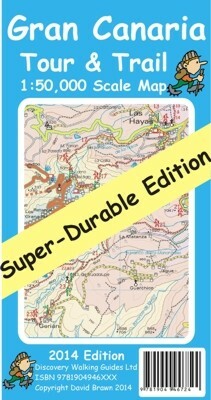 “We have just returned from nearly two weeks in Lanzarote, walking every day using the 3rd edition you kindly sent us. It had to happen eventually! We walked 26 (Uga to La Geria) in reverse (because we had walked part of it the recommended way on a previous trip) and saw a group approaching us down the road from La Asomada, one of whom was carrying a blue walk booklet exactly the same as I was! We exchanged notes and continued. I thought you’d be amused to learn of this. However, I will not do 33 that way round again! As well as having long steep ascents, the wind was blowing a gale into our faces on both the main upward sections making forward movement next to impossible. I will e-mail you shortly with a few observations about the new edition’s contents, but meanwhile I will mention a wry smile that I had when I read that you said “there were four or five wet days when you surveyed for the book”. We had rain or drizzle almost every day! Also, when we did walk 33 and were about 1/4 way up the unpathed ridge, the sun went in, the strong wind grew even stronger and was then accompanied by very heavy, virtually horizontal rain: even our boots clogged with the mud from the ground! We arrived very cold and bedraggled at Los Helechos restaurante, and although I agree with your scathing comments, it was a haven of warmth and dryness for us that day! Look at that sky! And snow on Mount Teide! 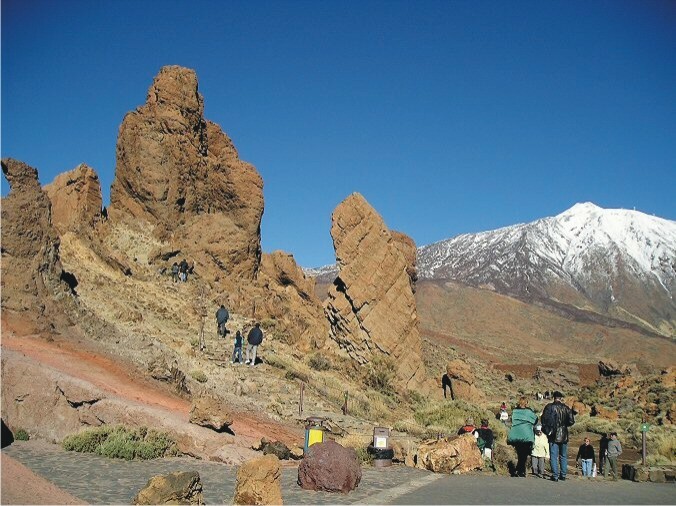 Here’s the Roques De Garcia – an easy walk though the air up here is thin, so take about half an hour to acclimatise. 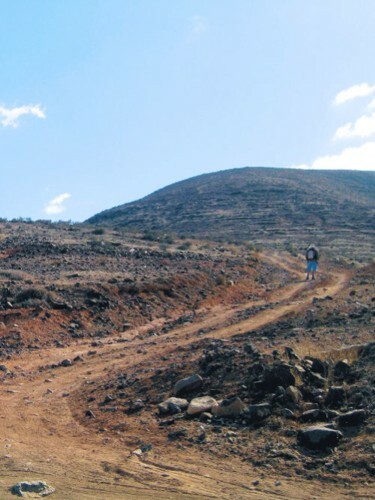 Walking amongst the mystical moonscape volcanic surroundings of Las Cañadas – it has to be walked to be believed. In the meantime, check out Rambling Roger’s website – this man knows walking on GC like the back of his hand and we thank him for his valuable input into the map detail. David, our cartographer, has been working on what will be the most detailed and up-to-date map of the dramatic island of Gran Canaria, Canary Islands. Keep checking here for the release date. 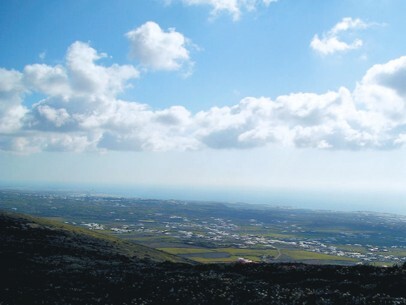 “Just to complement you on the excellent guide and map for Lanzarote. Having walked all over the world as well as in the UK we certainly agree that these are the clearest and most helpful guides we have found. We stayed outside Haria and this proved an ideal centre for all parts of the island – we did have a car. The map on its own would have been fine, but your personal comments and recommendations were greatly appreciated, as was the ability to link up the walks. As is to be expected there were one or two places where new buildings had been erected or the trail was obscure, but we never got lost. By the way, the restaurant / bar La Tegala in the cultural centre in Haria is great for local food and very reasonable, as is the Stop Bar in Yaiza. The one you describe in Ye wasn’t open while we were there, but maybe they don’t get much custom in January?